Posted on April 9, 2015 by WhoDunnit? Imagine a political system that puts the public first. Imagine an economy that gives everyone their fair share. Imagine a society capable of supporting everyone’s needs. Imagine a planet protected from the threat of climate change now and for the generations to come. That’s the world we want to create and we believe we have the means to do it. By ensuring that everyone has access to a secure job that pays at least the Living Wage we will build an economy that works for the common good, not just the privileged few. By restoring public services to public hands we will ensure they are run in the interests of the people that use them. By investing in renewable energy and reducing our reliance on fossil fuels, we will build a stable and sustainable society that protects our planet from climate change. By building more social rented homes and bringing abandoned buildings back into use we will ensure that everyone has a secure and affordable place to live. 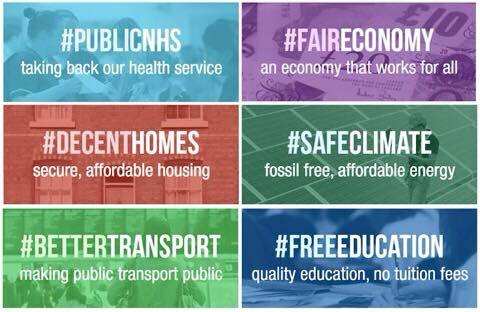 Vote for Green Party of England & Wales and you can help us build a society that works for the Common Good.